First stop on a tour of Tasmania was a pinot noir component tasting of Frogmore Creek’s Evermore pinot noir, where, according to the notes “every vintage we orchestrate several unconventional winemaking techniques for our micro-batches of handpicked grapes, which each develop their own flavours, aromas and textures as they ferment and mature in barrel” and which are blended into a final cuvée. 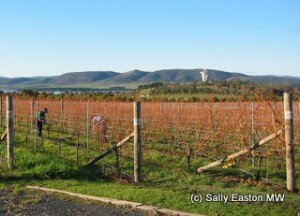 The 30 hectare Frogmore Creek vineyard from which fruit comes for this wine is at Penna, about half an hour north of Hobart. One of the Tasmanian wine industry’s founding fathers, Andrew Hood, consults here, having sold his own business to Frogmore Creek owner Tony Scherer in 2003. The winemakers are Alain Rousseau, and Nick Glaetzer, brother of Ben Glaetzer who runs the family winery Glaetzer Wines in the Barossa Valley. Nick also makes wine at Frogmore for his own Glaetzer-Dixon Family Winemakers label, and in 2011, won the 2011 Jimmy Watson trophy for his Mon Père Shiraz 2010 – from south Tasmania. The tasting and explanations from Glaetzer were both eye and palate opening. Component tasting of Frogmore Creek Evermore Pinot Noir, 2007 and 2011, in situ, February 2012. Medium pale colour. Red cherry nose, fruit forward, sweet focused, toasted, straightforward and safe. Less aromatic than the first, thicker wine on palate, with more savoury texture. Bit more layering on the palate and concentrated flavours. Good substance. Hint aromatic smokiness, light-medium weight, more elegant structure, lifted mid palate. Less overtly fruity, more savoury, wholesome, smooth texture, attractively balanced, bit of intellect in this one too. Nose a bit muted. Palate fragranced and floral, good depth of flavour, intensity and freshness. Bright red cherries, tunes, light tannin, flroal. Straight. Sweet spicy nose, with sweet black pepper notes. Not very pinot noir like. Glaetzer: “We cut the cordons. It adds ~1 Baumé increase in sugar levels. Spicy red berries, fuller body, black pepper, hints of grip and becomes ‘red wine’, not pinot noir. The commercial release has 25-30% ‘amarone-style’, with 3% carbonic maceration, plus 5-8% of all the other components. Anything not used goes to the standard Frogmore label. Tarry aromatic note, smooth and spicy warmth to palate attack and sour cherry mid palate. Not sure it has true pinot noir varietal character by my definition. Scientists at AWRI in Hobart. Drained most of the juice away, and kept in a cool room. Once skins had fermented to 2 Baumé, he added the juice back. Dark berry fruits, quite grippy component to tannin, fine grain, full-bodied. Chunky, slightly four-square. A yeast strain purified by AWRI, which accentuates savouriness, losing fruit brightness. Spice, black peppercorns on nose, sweet bass rumtopf (without all the alcohol) stewed fruit a bit on the palate. Bit loose and amoeboid. Destem. Put in fridge at 5°C for 10 days, let warm up by self and fermentation with natural yeast. Cold red berries, bright and sawdust notes. Round and glycerol-like sweetness mid palate. Lots of flavour at front, less at back. Crunchy balance. Kept outside to delay malo ‘til spring, when weather warms up naturally (the natural course of events in Burgundy). Idea is it spends longer time on lees. No great nose, sweet attack, rich, full texture (malo lees? ), attractive. Lush with good varietal definition. Very nice on its own, for me. Has some power with elegance and succulence. But maybe lacks a bit of tartness to the acidity, somewhat full and fat. Lifted parma violets, sweet attack, bit slimy and dominant. Pinot noir varietal definition lost. Plus 3% gewurztraminer frozen for a month, which shatters the skin walls. Aromatic again, floral. Pinot noir varietal definition lost, gives perception of sweetness, and broadness. Floral, rose petal perfume, quite gewurz-like. Not very pinot noir like. Slippery tannins, and loose backbone. Lots of floral intensity. Spicy, black pepper and warmth, stewed fruits. Not much pinot noir varietal definition. Full and spicy with tannic backbone and warmth. Juicy red cherries on nose, light and crunchy with good intensity. Straight down the line. I like the straightforward honesty of this. Toasty, sandy nose, juicy lifted cherry fruits, crunchy, medium weight, young and crunchy, well balanced, fragrant mid palate. Good. So whilst not finding much fragrant, lifted, tart cherry and cranberry pinot noir character in the amarone-style component, the 2011 final blend for me is more successful (more pinot noir-like), than the 2007, which has a similar amount of this component. Will the 2011 lose varietal definition with age, or have other components in the 2011 moderated the influence of ‘amarone-style’? Or maybe it’s vintage variation. It’s great to experience this level of experimentation and searching for style.